Jared Unzipped: Why Lock Up The Condoms? While in a Wal-Mart just a few hours ago, I was shopping for some cocoa butter lotion. I happened to pass the 'family planning' section and snapped the photo shown above. 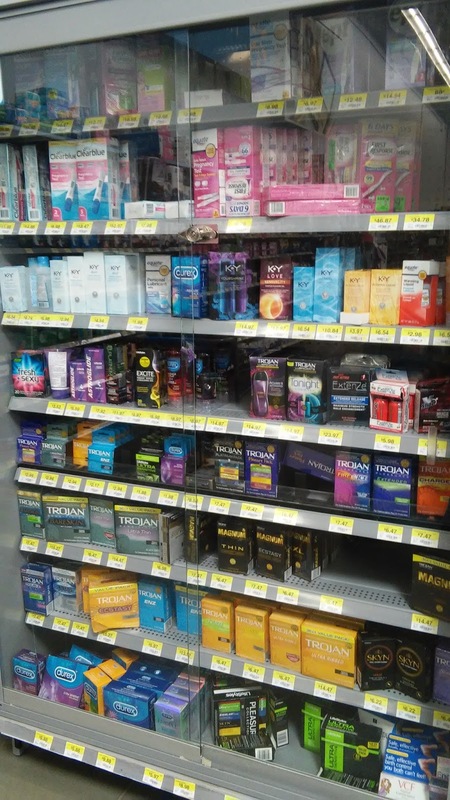 Of all the things to be locked behind a glass case, condoms shouldn't be it. I realize that these condoms are locked up because some people may steal them. And yet, there's an entire store filled with items that could be stolen -- shoes, make-up, food, fishing tackle. Wal-Mart's Loss Prevention team can probably identify a hundred other products with a higher risk to loss potential. So why lock up the condoms? This country desperately needs to slow it's birth rate across the board. We should promote the active use of birth control, especially condoms. They're cheap and proven to be effective. And yet, Wal-Mart (and surely other retailers) wish to prohibit their sale. A customer wishing to purchase them must seek assistance from a store associate. Many people won't bother because of the extra hassle or potential embarrassment factor. I say release the condoms from their cage and put them in the hands of the people... so there's less people.